About 60 per cent of global trade, which today amounts to more than $20 trillion, consists of trade in intermediate goods and services that are incorporated at various stages in the production process of goods and services for final consumption. The fragmentation of production processes and the international dispersion of tasks and activities within them have led to the emergence of borderless production systems. These can be sequential chains or complex networks, their scope can be global or regional, and they are commonly referred to as global value chains (GVCs). GVCs lead to a significant amount of double counting in trade, as intermediates are counted several times in world exports but should be counted only once as “value added in trade”. Today, some 28 per cent of gross exports consist of value added that is first imported by countries only to be incorporated in products or services that are then exported again. 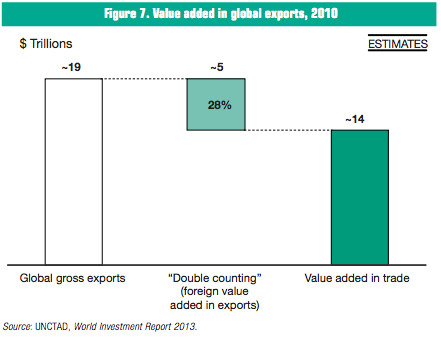 Some $5 trillion of the $19 trillion in global gross exports (in 2010 figures) is double counted (figure 7). Patterns of value added trade in GVCs determine the distribution of actual economic gains from trade to individual economies. The spread of GVCs is greater in some industries where activities can be more easily separated, such as electronics, automotive or garments, but GVCs increasingly involve activities across all sectors, including services. While the share of services in gross exports worldwide is only about 20 per cent, almost half (46 per cent) of value added in exports is contributed by services-sector activities, as most manufacturing exports require services for their production. The majority of developing countries are increasingly participating in GVCs. The developing-country share in global value added trade increased from 20 per cent in 1990 to 30 per cent in 2000 to over 40 per cent today. However, many poorer developing countries are still struggling to gain access to GVCs beyond natural resource exports. Regional value chain links are often more important than global ones, especially in North America, Europe, and East and South-East Asia. In the transition economies, Latin America and Africa, regional value chains are relatively less developed. GVCs are typically coordinated by TNCs, with cross-border trade of inputs and outputs taking place within their networks of affiliates, contractual partners and arm’s-length suppliers. TNC-coordinated GVCs account for some 80 per cent of global trade. Patterns of value added trade in GVCs are shaped to a significant extent by the investment decisions of TNCs. 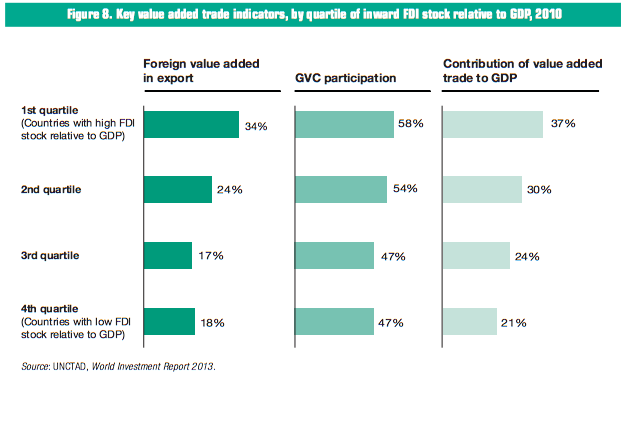 Countries with a higher presence of FDI relative to the size of their economies tend to have a higher level of participation in GVCs and to generate relatively more domestic value added from trade (figure 8). TNCs coordinate GVCs through complex webs of supplier relationships and various governance modes, from direct ownership of foreign affiliates to contractual relationships (in non-equity modes of international production, or NEMs), to arm’s-length dealings. These governance modes and the resulting power structures in GVCs have a significant bearing on the distribution of economic gains from trade in GVCs and on their long-term development implications. TNC decisions on where to invest and with whom to partner are driven by GVC locational determinants that depend on the GVC segment, task or activity. Locational determinants for GVC segments are often different, and fewer, than those for vertically integrated industries – i.e. the determinants for electronics assembly activities are fewer than those for investment in the electronics industry as a whole. For many GVC segments, there are relatively few “make or break” locational determinants that act as preconditions for countries’ access to GVCs. GVCs spread value added and employment to more locations, rather than hoarding them only in those locations that are capable of carrying out the most complex tasks. As such, they can accelerate the “catch-up” of developing countries’ GDP and income levels and lead to greater convergence between economies. At the global level, that is the essential development contribution of GVCs. At the country level, domestic value added created from GVC trade can be very significant relative to the size of local economies. In developing countries, value added trade contributes nearly 30 per cent to countries’ GDP on average, as compared with 18 per cent for developed countries. There is a positive correlation between participation in GVCs and GDP per capita growth rates. Economies with the fastest growing GVC participation have GDP per capita growth rates some 2 percentage points above the average. Furthermore, GVC participation tends to lead to job creation in developing countries and to higher employment growth, even if GVC participation depends on imported contents in exports. But the experience of individual economies is more heterogeneous. The value added contribution of GVCs can be relatively small where imported contents of exports are high and where GVC participation is limited to lower-value parts of the chain. Also, a large part of GVC value added in developing economies is generated by affiliates of TNCs, which can lead to relatively low “value capture”, e.g. as a result of transfer pricing or income repatriation. However, even where exports are driven by TNCs, the value added contribution of local firms in GVCs is often very significant. And reinvestment of earnings by foreign affiliates is, on average, almost as significant as repatriation. As to employment gains, pressures on costs from global buyers often mean that GVC-related employment can be insecure and involve poor working conditions, with occupational safety and health a particular concern. Also, stability of employment in GVCs can be low as oscillations in demand are reinforced along value chains and GVC operations of TNCs can be footloose. However, GVCs can serve as a mechanism to transfer international best practices in social and environmental issues, e.g. through the use of CSR standards, although implementation of standards below the first tier of the supply chain remains a challenge. Longer-term, GVCs can be an important avenue for developing countries to build productive capacity, including through technology dissemination and skill building, opening up opportunities for industrial upgrading. However, the potential long-term development benefits of GVCs are not automatic. GVC participation can cause a degree of dependency on a narrow technology base and on access to TNC-coordinated value chains for limited value added activities. At the firm level, the opportunities for local firms to increase productivity and upgrade to higher value added activities in GVCs depend on the nature of the GVCs in which they operate, the governance and power relationships in the chain, their absorptive capacities, and the business and institutional environment in the economy. At the country level, successful GVC upgrading paths involve not only growing participation in GVCs but also higher domestic value added creation. At the same time, it involves gradual expansion of participation in GVCs of increasing technological sophistication, moving from resource-based exports to exports of manufactures and services of gradually increasing degrees of complexity. Countries need to carefully weigh the pros and cons of GVC participation, and the costs and benefits of proactive policies to promote GVCs or GVC led development strategies, in line with their specific situation and factor endowments. Some countries may decide not to promote GVC participation. Others may not have a choice: for the majority of smaller developing economies with limited resource endowments there is often little alternative to development strategies that incorporate a degree of participation in GVCs. The question for those countries is not so much whether to participate in GVCs, but how. In reality, most are already involved in GVCs one way or another. Promoting GVC participation requires targeting specific GVC segments, i.e. GVC promotion can be selective. Moreover, GVC participation is one aspect of a country’s overall development strategy. If countries decide to actively promote GVC participation, policymakers should first determine where their countries’ trade profiles and industrial capabilities stand and evaluate realistic GVC development paths for strategic positioning. Gaining access to GVCs, benefiting from GVC participation and realizing upgrading opportunities in GVCs requires a structured approach that includes (i) embedding GVCs in overall development strategies and industrial development policies, (ii) enabling GVC growth by creating and maintaining a conducive investment and trade environment, and by providing supportive infrastructure and (iii) building productive capacities in local firms. Mitigating the risks involved in GVC participation calls for (iv) a strong environmental, social and governance framework. And aligning trade and investment policies implies the identification of (v) synergies between the two policy areas and in relevant institutions (table 3). GVC-related development strategies require more targeted policies focusing on fine-sliced activities in GVCs. They also increase the need for policies dealing with the risk of the middle-income trap, as the fragmentation of industries increases the risk that a country will enter an industry only at its low-value and low-skill level. GVCs require a new approach to trade policies in industrial development strategies, because protective trade policies can backfire if imports are crucial for export competitiveness. Trade policies should also be seen in light of the increased importance of regional production networks as GVC-based industrialization relies on stronger ties with the supply base in neighbouring developing economies. The need to upgrade in GVCs and move into higher value added activities strengthens the rationale for building partnerships with lead firms for industrial development. At the same time, GVCs call for a regulatory framework to ensure joint economic and social and environmental upgrading to achieve sustainable development gains. 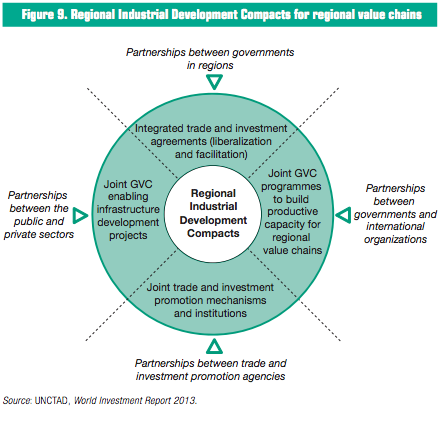 Finally, GVCs require a more dynamic view of industrial development. Development strategy and industrial development policies should focus on determinants that can be acquired or improved in the short term and selectively invest in creating others for medium- and longterm investment attractiveness, building competitive advantages along GVCs, including through partnerships with business. For policymakers, a starting point for the incorporation of GVCs in development strategy is an understanding of where their countries and their industrial structures stand in relation to GVCs. That should underpin an evaluation of realistic GVC development paths, exploiting both GVC participation and upgrading opportunities. 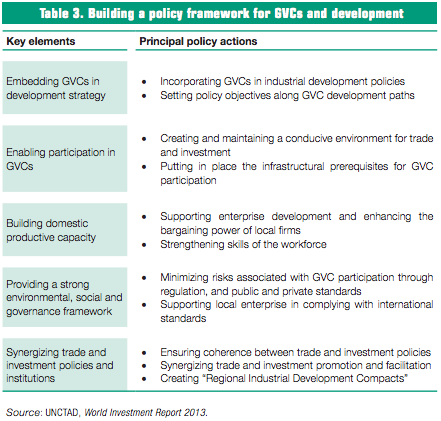 UNCTAD’s GVC Policy Development Tool can help policymakers do this. Enabling participation in GVCs. Enabling the participation of local firms in GVCs implies creating and maintaining a conducive environment for investment and trade, and putting in place the infrastructural prerequisites for GVC participation. A conducive environment for trade and investment refers to the overall policy environment for business, including trade and investment policies, but also tax, competition policy, labour market regulation, intellectual property, access to land and a range of other policy areas (see UNCTAD’s Investment Policy Framework for Sustainable Development, IPFSD, which addresses relevant trade and other policy areas). Trade and investment facilitation is particularly important for GVCs in which goods now cross borders multiple times and where there is a need to build up productive capacity for exports. Providing reliable physical and “soft” infrastructure (notably logistics and telecommunications) is crucial for attracting GVC activities. Developing good communication and transport links can also contribute to the “stickiness” of GVC operations. As value chains are often regional in nature, international partnerships for infrastructure development can be particularly beneficial. Building domestic productive capacity. A number of policy areas are important for proactive enterprise development policies in support of GVC participation and upgrading: First, enterprise clustering may enhance overall productivity and performance. Second, linkages development between domestic and foreign firms and inter-institution linkages can provide local SMEs with the necessary externalities to cope with the dual challenges of knowledge creation and internationalization, needed for successful participation in GVCs. Third, domestic capacity-building calls for science and technology support and an effective intellectual property rights framework. Fourth, a range of business development and support services can facilitate capacity-building of SMEs so they can comply with technical standards and increase their understanding of investment and trade rules. Fifth, there is a case for entrepreneurship development policy, including managerial and entrepreneurial training and venture capital support. Sixth, access to finance for SMEs helps to direct development efforts at the upstream end of value chains where they most directly benefit local firms. Furthermore, an effective skills development strategy is key to engagement and upgrading in GVCs, and to assist SMEs in meeting the demands of their clients with regard to compliance with certain CSR standards. It can also facilitate any adjustment processes and help displaced workers find new jobs. Policymakers should also consider options to strengthen the bargaining power of domestic producers vis-à-vis their foreign GVC partners, to help them obtain a fair distribution of rents and risks and to facilitate gaining access to higher value added activities in GVCs (WIR 11). Providing a strong environmental, social and governance framework. A strong environmental, social and governance framework and policies are essential to maximizing the sustainable development impact of GVC activities and minimizing risks. Host countries have to ensure that GVC partners observe international core labour standards. Equally important are the establishment and enforcement of occupational safety, health and environmental standards in GVC production sites, as well as capacity-building for compliance. Buyers of GVC products and their home countries can make an important contribution to safer production by working with suppliers to boost their capacity to comply with host country regulations and international standards, and avoiding suppliers that disrespect such rules. Suppliers are increasingly under pressure to adapt to CSR policies in order to ensure their continuing role in GVCs. EPZs are an important hub in GVCs and present an opportunity for policymakers to address CSR issues on a manageable scale. Policymakers could consider adopting improved CSR policies, support services and infrastructure in EPZs (e.g. technical assistance for certification and reporting, support on occupational safety and health issues, recycling or alternative energy facilities), transforming them into centres of excellence for sustainable business and making them catalysts for the implementation of CSR. Governments or zone authorities could opt to offer such benefits in addition to or instead of some of the existing benefits offered to firms in EPZs. Benefits for firms could include cost sharing, harmonization of practices, reduced site inspections and others. International organizations can help through the establishment of benchmarks, facilitation of exchanges of best practices, and capacity-building programmes. A host of other concerns and corporate governance issues should be addressed to minimize risks associated with GVCs. These include transfer pricing, where GVCs have the duplicate effect of increasing the scope for transfer price manipulation and making it harder to combat, to the detriment of raising fiscal revenues for development. In addition, to safeguard industrial development processes, governments should seek to foster resilient supply chains that are prepared for and can withstand shocks, and recover quickly from disruption. Synergizing trade and investment policies and institutions. As investment and trade are inextricably linked in GVCs, it is crucial to ensure coherence between investment and trade policies. Avoiding inconsistent or even self-defeating approaches requires paying close attention to those policy instruments that may simultaneously affect investment and trade in GVCs, i.e. (i) trade measures affecting investment and (ii) investment measures affecting trade. At the institutional level, the intense trade and investment links in GVCs call for closer coordination between domestic trade and investment promotion agencies, as well as better targeting of specific segments of GVCs in line with host countries’ dynamic locational advantages. A number of objective criteria, based on a country’s GVC participation and positioning, can help determine the most appropriate institutional set-up for trade and investment promotion. Synergies should be sought also through integrated treatment of international investment and trade agreements. Regional trade and investment agreements are particularly relevant from a value chain perspective, as regional liberalization efforts are shaping regional value chains and the distribution of value added. In fact, the relevance of regional value chains shows the potential impact of evolving regional trade and investment agreements towards “Regional Industrial Development Compacts”. Such Compacts could focus on liberalization and facilitation of trade and investment and establish joint investment promotion mechanisms and institutions. They could extend to other policy areas important for enabling GVC development, such as the harmonization of regulatory standards and consolidation of private standards on environmental, social and governance issues. And they could aim to create cross-border industrial clusters through joint investments in GVCenabling infrastructure and productive capacity building. Establishing such compacts implies working in partnership – between governments in the region to harmonize trade and investment regulations and jointly promotion trade and investment, between governments and international organizations for technical assistance and capacity-building, and between the public and private sectors for investment in regional value chain infrastructure and productive capacity (figure 9).